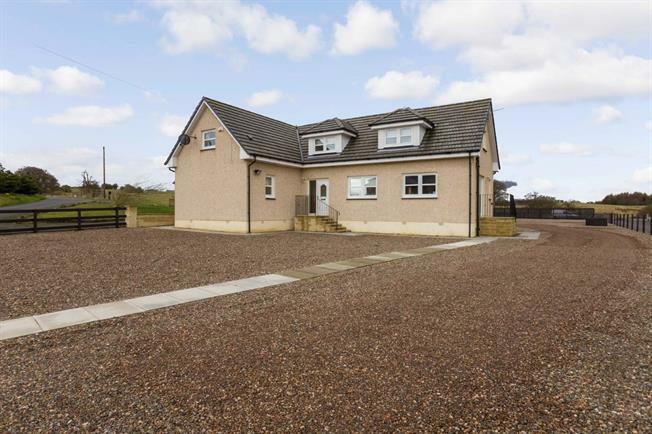 5 Bedroom Detached House For Sale in Shotts for Fixed Price £295,000. Mill Cottage is a sizeable and modern detached villa extending to approximately 2600 sqft of flexible accommodation set within Allanton Mill on the outskirts of Shotts. The property offers a high specification finish and a pleasing arrangement of traditionally sized apartments as follows; welcoming reception hall, rear facing lounge, sizeable dual aspect dining kitchen with French doors to garden, bedroom with en-suite and family bathroom. The ground floor is completed by a fifth bedroom or family room. The upper level provides three additional and especially spacious bedrooms, one with en-suite bathroom with a further bathroom accessed from the landing. Fresh and tasteful decoration is on offer with features including double glazing and LPG central heating. The property benefits from most substantial garden grounds incorporating an expansive driveway with extensive off road parking. The splendid semi rural setting is sure to appeal to the discerning buyer with internal viewing required to appreciate fully.